...Went on a little spree in the Halloween section at Target (well really, what visit to Target isn't a spree?) 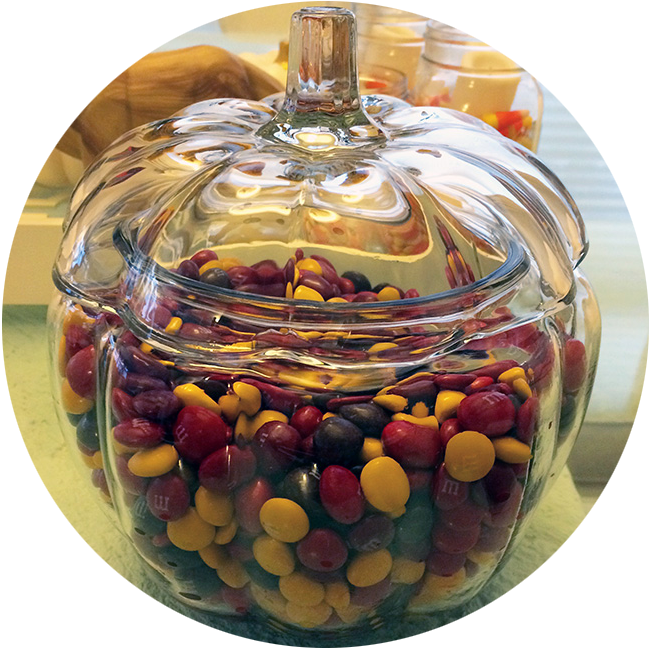 and came away with an adorable pumpkin jar that I promptly filled with four bags of fall M&M's. Let's just say, Jeff was a bit happier with this Target trip than most. ...Finally watched Neighbors and I don't know why I waited so long. It was freaking hysterical, I was dying. While I loved the fighting and whatnot, I think the best part was the relationship between Seth Rogan and Rose Byrne, they were so funny together. ...Went shopping with the boy, and felt like I was in the Twilight Zone - he came away with bags of stuff, and I was empty handed! ...Hit up one of the bars in our neighborhood for one of our favorite types of date nights: beer and wings. We like to keep it classy. ...Went to a big party at my grandma's house, where it turned out she'd managed to invite tons of family members I've never even met before. Hanging out with my aunts and laughing about our shared obsession over WGN news ("Did you see the time they reported a fake plane crash?" "Did you see the time they failed on reporting a bridge collapse?") made for quite an amusing evening. I watched The Neighbors this weekend, too. Did NOT stop laughing!! stocking up on Halloween candy is the best indulgence.. <3 and I liked Neighbors too! I love that jar its so sweet! Good call on the pumpkin full of M&Ms...they're my favorite candy and biggest weakness!! !